215km, 15 to 30kph (6h48m to 13h32m). 1900m of climbing. This event has taken place. A brief report and photos are available here. This event will be BRM in 2019 for Paris-Brest-Paris qualification. IMPORTANT — the rides are going ahead in spite of the weather warning. I have emailed all riders, but if you didn't receive it then read it here. 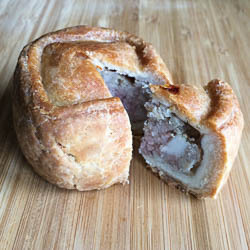 We love a good pork pie! 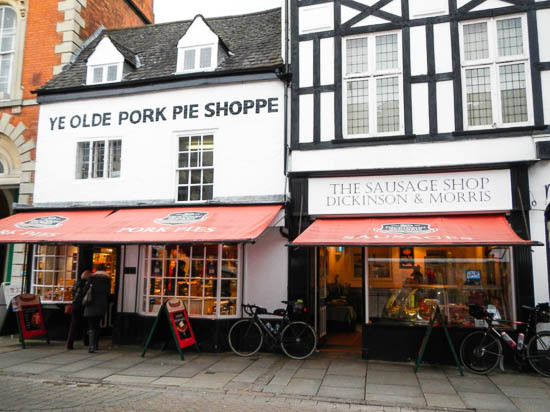 Melton Mowbray is synonymous with that tasty, pastry-covered block of jelly-enshrined meat! Nom-nom! 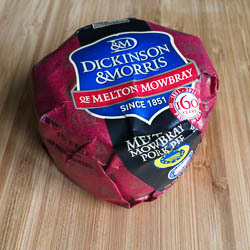 Wikipedia suggests that Melton Mowbray promotes itself as the Rural Capital of Food and that it is also one of the five homes of Stilton cheese. This all adds up to a very good reason to go there: food. I like the look of this, bringing pies to the people, almost like a British version of the Beaujolais run but with pork pies! I think I could be in. This is a surprisingly hilly — and fun! — route for one starting from Cambridge: made more fun because most of the hills are concentrated at the far end. However, a flat and quick run-out for the first leg, and a mostly flat and quick run back in again on the final leg mean that you should easily make back any time you lose climbing les Alpes de Leicestershire. This event takes place in mid-March, so expect a bit of weather en route — and pray for a north-westerly to blow you back home after all that winching! We've posted a report from our side from a previous year here (clickety). This year's event is once again just a single control at Melton Mowbray — it is up to individual riders to decide for themselves whether they wish to push on thru without stopping in a single 105km stage, or instead to stop for a break in Oundle or Oakham on the way out, and in Oundle, Huntingdon or St Ives on the return leg. You are never that far from sustenance, but it's up to you to decide when you need to stop. Starting from Girton on the northern edge of Cambridge, this ride heads north-west to St Ives and onwards, flirting with the fens and providing a very fast run-out to the most historic Northamptonshire town of Oundle, famous for its centuries-old school, as well as the one-time home of Billy Bragg. (Note: Oundle is not a control this year — you are welcome to stop for a cup of tea, but you don't have to if you're feeling strong.) From Oundle, the route climbs steadily before dropping down into Melton Mowbray, where you can sample some really great food (there's also a MacDonald's and a Gregg's should you wish). The return leg takes a distinctly scenic route out of Melton Mowbray and the 60km to Oundle will likely challenge flatlanders (although not uplanders), which is good and character-building. The upside is that the run from Oundle back to Cambridge is very flat and any time you lost in the hills you should easily gain on the flat — the final 50km has only two hills, they're really only bumps, and the very final 30km is pan-flat and lit with fairy lights along the Busway — just look at the elevation profile above. This is definitely a route of two halves. Flattish to Oundle and back, with hills between Oundle and Melton Mowbray … All in all this was a thoroughly enjoyable ride with much fine scenery, mostly very quiet roads, and challenging but not punishing hills. I'd give it a 10/10. 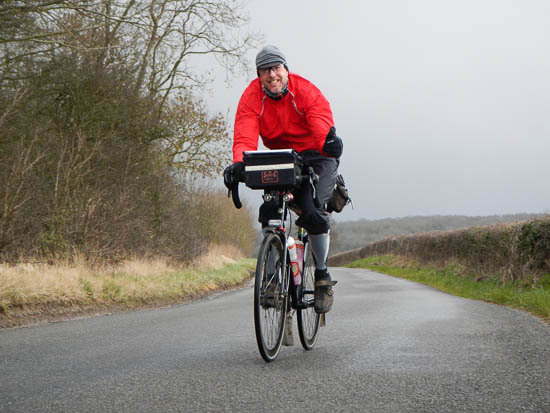 The route passes through traditional sandstone villages in Cambridgeshire, Northamptonshire, Rutland and Leicestershire, as well as the ancient market towns of St Ives, Huntingdon, Oundle, Oakham, and Melton Mowbray. If you are lucky you will see lots of red kites and other hawks flying overhead — when we tested this route we saw dozens of individual raptors a-wing, a real pleasure! Also, for those who like a bit of an extra challenge, or who rode it last year and would like to try something else, then there is an alternative and rather scenic route available — the “Extra Slice”. This route includes even more hills and is borderline AAA, at the cost of an additional 10km, so 225km in all, but no extra time allowed. If you're a Flatlander like me then the Classic (this page) is probably hard enough for March! This year, the Extra route is leftwards and so you'll see the scenery from the other side compared to last year. The route was last ridden (as a perm) in February 2018, with nothing to report. From experience, this route can get somewhat agricultural in places, although last year's farm-yard conditions aren't present this year, phew! Mudguards are requested for the benefit of café proprietors and other riders. Note that if you're looking for the extra-slice route details then see this page — if you don't know what that is, it's probably not for you! Light refreshments will be available before the start from about 7am. There will be hot’n’cold refreshments and cake at the finish. All refreshments at the start/finish are included in the entry fee. The arrivée will be manned, so we will collect your brevet from you on completion, along with the single proof-of-passage from Melton Mowbray. Please remember to fill out the box with establishment name and time, and sign your brevet before handing it in with your PoPs! Have a great, safe ride!